Today, we have a special visitor, Lori McGrath, who pens her thoughts at The Write Mama. In a Q&A, she’s going to tell us about BC’s Sunshine Coast with kids — where to go, what to do, and where to eat. I grew up spending my summer vacations on the Sunshine Coast of British Columbia, a truly beautiful place – filled with oceans and trails, cozy cottages and beaches, parks and wildlife. 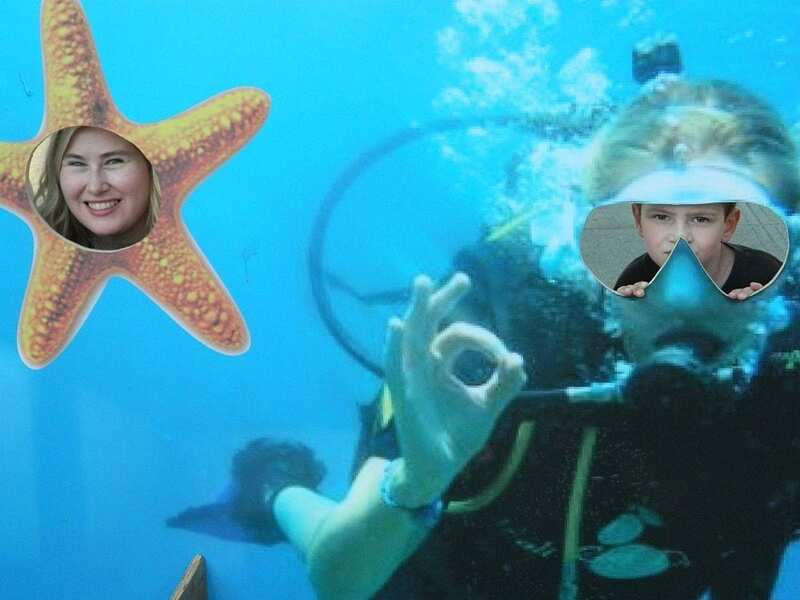 Now that I have a five-year-old son, my family is rediscovering all the things that make the Sunshine Coast such a great destination for families. We stay at our family cabin near the town of Gibsons, which is the main marine gateway for the Sunshine Coast. Arriving in Gibsons requires no more than a 40-minute ferry ride from West Vancouver and a short drive. Further up the coast, you encounter the towns of Roberts Creek, Sechelt, Halfmoon Bay, Davis Bay and Pender Harbour. Where are the best places to stay with kids on the Sunshine Coast? The best way for families to stay on the Sunshine Coast is to check out a website like VRBO. A place to rent near the water, along the Strait of Georgia, is best. There’s nothing like drifting off to sleep listening to the sounds of the waves. Spend days walking logs, searching for shells, making sandcastles, fishing on the dock and swimming in the ocean with the kids. You’ll wish you could stay forever. If you can’t find a rental, there are a ton of B&Bs and local resorts to choose from. 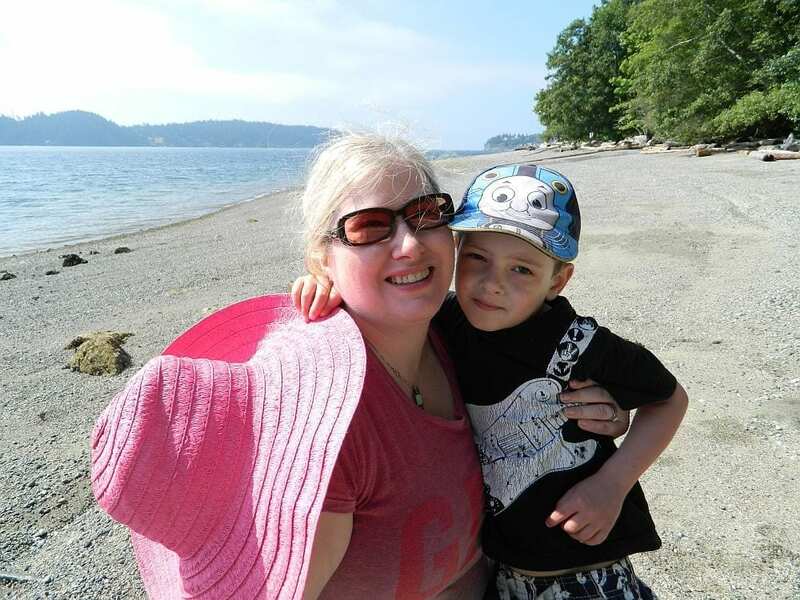 For camping families, Porpoise Bay Provincial Park in Sechelt has a lovely sandy beach, playground, picnic tables, tons of shade, real bathrooms and showers, hiking trails plus a campground within easy walking distance of all these facilities. It’s a truly lovely spot for a day visit or for camping. You can also rent kayaks or book kayaking lessons or tours from Talaysay Tours right at the park. Reservations for the Porpoise Bay campground are busy so book ahead through the BC Parks Discover Camping Reservation Service. What’s the best Sunshine Coast playground, in your opinion? The best playground we have found in the area is at Porpoise Bay Provincial Park. Bring a picnic lunch and make a day of it playing on the beach and enjoying the picnic area in the park. Tons of shade. Tons of sand. Tons of fun. Old Boot Eatery, Sechelt: We stopped here for an Italian style lunch, with salad, pasta, pizza and baked sandwich choices. My son was offered an activity book and crayons to keep him busy. Your kids will enjoy the kids menu, as long as they are pasta eaters! Molly’s Reach, Gibsons: This restaurant was a backdrop for the Canadian TV show “The Beachcombers” (1972 -1990). A fun bit of history is that the show tried to rent my grandparent’s cabin and when the TV crew rudely tried to make too many changes to it, my grandma Dody threw them out! If you were a fan of the show or just like checking out local lore, be sure to stop in for some fish and chips. The kids menu has a good variety of choices and prices are reasonable. Takeout is available if that works better for your family. Mikes Gelato, Gibsons: Mosey around the Gibson’s Marina and check out the boats after your meal and then walk up to enjoy gelato. Don’t bother ordering the small size– you’ll need at least a medium to fully appreciate the burst of flavour you are about to enjoy (there is a kids’ size for the little ones too)! Gramma’s Marine Pub, Gibsons: If you happen to have babysitting available and you are able to sneak away for a pub dinner, be sure to drop by. Sit on the patio with its oceanfront view of Gibson’s Harbour, and order some seafood and a margarita. Happily, there is also a takeout window available; find a picnic table nearby or walk over to Pioneer Park for a picnic. You can also order takeout straight from the pub. Wheatberries Bakery, Upper Gibsons or Sechelt. When you are in the mood for a treat, I highly recommend stopping by this restaurant, which focuses on the handmade and organic. Kids love the cookies and the adults can get a latte and maple cinnamon bun and then take home some oven-fresh bread. I can’t wait to return next summer! 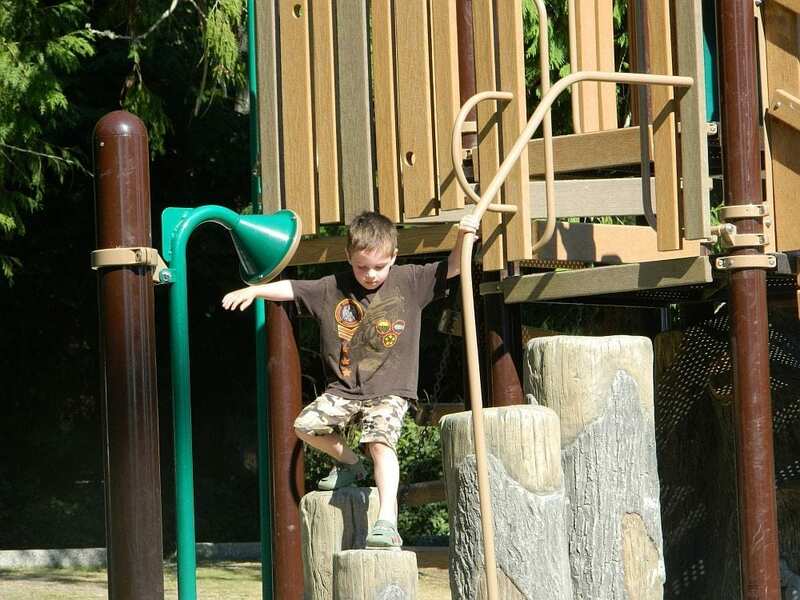 What are your favorite things to do with kids in Gibsons or nearby? If you are in the mood for a movie, visit the one-screen Gibsons Cinema in Gibsons or the three-screen Ravens Cry Theatre in Sechelt. We watched a matinee of Monsters University this summer and it was a nice couple of hours out of the hot sun and we love how these smaller theatres feature very affordable prices. On a past trip with our son, we visited the Chapman Fish Hatchery which welcomes families to drop in and tour the facility at any time. Every July, the hatchery hosts Catch a Trout Day and this year, kids are invited to stop by to catch a trout for the rest of the summer and early fall between 10 am – 3 pm Monday to Saturday. The Sechelt Night Market runs on Thursday nights from June through September, and offers entertainment for the whole family. We enjoyed taking in the classic cars, the magician and the entertainment after a dinner out in the town. The on-site petting zoo was run by Mystique Andalusians & Farm Ventures, which also offers an interactive farm experience for families on their farm in Roberts Creek, but only on weekends by appointment. 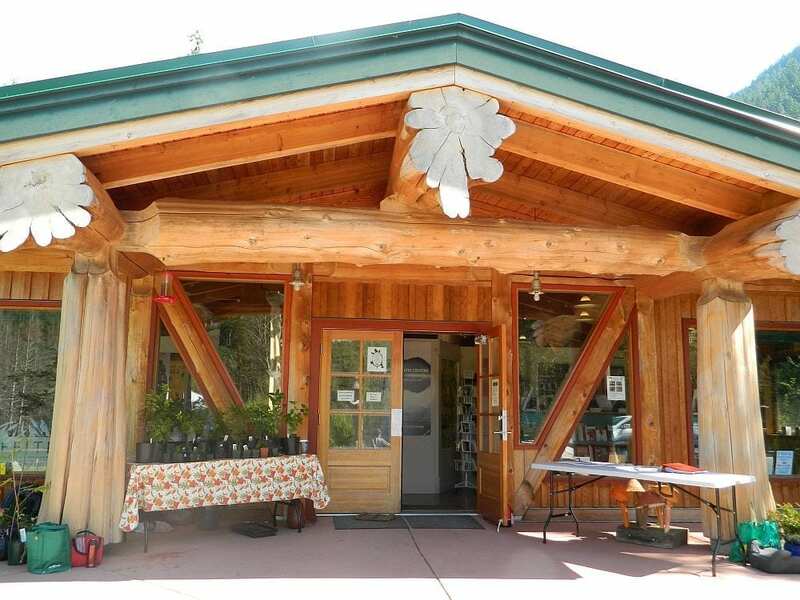 Kids enjoy the nature trails, picnic area and interpretive exhibits at Iris Griffith Interpretive Centre at Ruby Lake. While there, check out the center itself, made of natural wood beams. The center even uses solar power and a solar water heating system. My son was fascinated by these features! I wouldn’t do this 4 km hike yet with my five-year-old, but if your kids are older, head for the world renowned rapids of Skookumchuck Narrows at Skookumchuk Provincal Park in Egmont. Be sure to check the local paper which publishes the local tide tables before you go so you get there at the best viewing time. Allow 1 hour each way and be sure to bring plenty of water on a hot day! How about your favorite shops? Any favorite Sunshine Coast toy stores? Drop in at Yoga by the Sea in Roberts Creek for some relaxation during your vacation. Visit the Swallow’s Nest in Upper Gibsons to browse amongst the unique vintage furnishings, home decor, fashion, jewelry, and gift lore. Nip over to the Pastimes Toy Store in Sechelt or Greatkids Toys in Gibsons. Both stores have a great selection of games, crafts, and toys to choose from. Peggy Sues Gifts Boutique at Gibsons Landing has a great selection of designer kids clothes as well as dancewear for kids and a small selection of classic toys. My husband, a musician, always makes a point to stop in at the Melo Mania Music Store in Roberts Creek. It’s the only music store on the Sunshine Coast and my husband says he enjoys chatting with the owner as much as he enjoys checking out the guitars. I hope this gives you a taste of the wonders of the Sunshine Coast. There is so much more to see and discover but you’ll just have to come for a visit to find out for yourselves!